You choose a caregiver: your daughter, son, relative, or friend — anyone except your spouse. We come to your home to enroll you in the program. You get ongoing care from a person who loves you . They get compensated for their time, so they can pay their bills too! Want loving care...from someone you love? 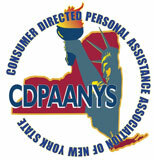 Not all CDPAP consumers will get approved for the same number of hours: there’s a wide range of eligibility. Your Medicaid Managed Long-Term Care plan will determine how many hours you will receive. With CDPAP by FreedomCare, you can get exceptional care from someone you love — while giving them reliable pay for their time. Care from a family member is associated with better health — and longer life. When you’re deeply familiar with your aide, everyone communicates more effectively. Studies show that when your aide is a family member, turnover is 50% less likely. You’re more likely to stay healthy in the hands of a family member. "I was in between jobs, looking for a new one. I thought: ‘What’s going to happen to my mom while I️’m at work all day? When I told her I’d be caring for her every day, her face lit up. It was a thrilling moment for me." "I’m an entrepreneur. Being there for my mom did not allow me to generate the income I needed, so getting financial assistance while taking care of her is a win-win."